Fast Joint Idea Gallery! See photos of customer created Fast joint projects. SAVE $61! Four templates included! Four templates included! 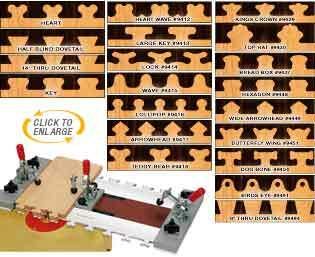 Use a router table and our interchangeable templates to create up to 20 unique joints! Choose 4, 11 or 20 Template Sets! 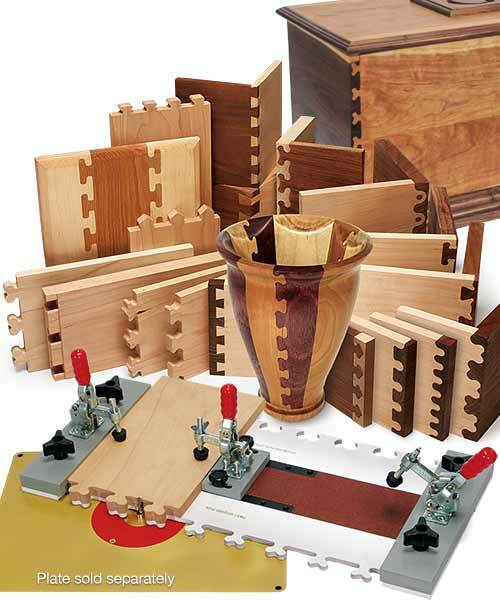 A complete joinery system that creates unique, decorative, and strong joints quickly and easily! 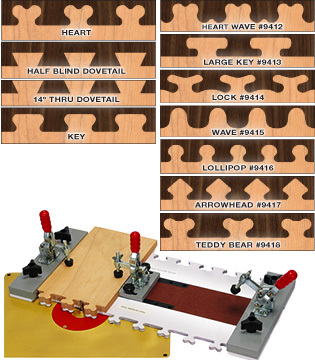 This unique jointing system "spices up" standard joinery with matching templates that make creative, custom joinery simple. Insert your bit in the router, insert a guide bushing into your router table insert, set your bit height and you're ready to go. Set male and female templates on opposite sides of the jig platform and start cutting. 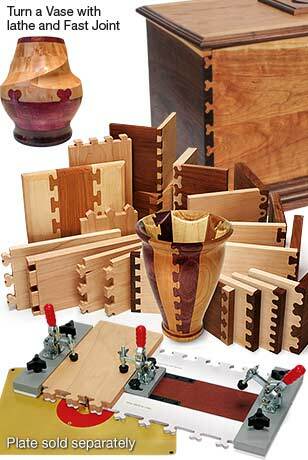 For stock 1/4" to 3/4" thick (1/4" to 3/8" for thru dovetails) and up to 14" wide. 4 templates are included! (See larger sets below). For table mounted routers that accept template guide bushings only. Not compatible with Ryobi or Bosch router tables. SAVE $61! List price $231.36. 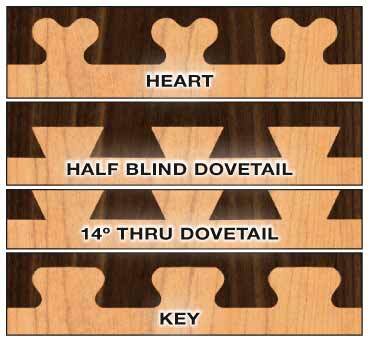 Choose 16 individual decorative & interesting joint profiles to "spice up" standard joint. I finally got the chance to use this for a drawer in a small TV stand. I was able to use 1/2" stock for all four sides. The key is to cut the male sides first, then lower the bit to the height of the stock while it is in the jig. I'm only going with 4 stars as the 3/16" bit that was included became dull very quickly and actually started to turn brown. This was after less than 3' of surface cut. I even took small cuts with multiple passes. The more I used it, the worse the chatter became. I've order a carbide bit to see how that goes. It sounds like your bit may have pitch and sawdust build up and needs to be cleaned. AS stated before on other reviews, I wanted to make drawers with all sides 1/2 inch thickness and could not do it with this jig. Statements are a little misleading in the write-ups. 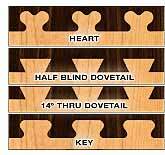 Making a Hope Chest for my granddaughter using the "heart Shape Jig". Knew from the start that practice makes perfect ... like anything else. Been using scrap wood to practice on prior to cutting into the cherry stock. Enjoy using the system and the joints are coming out nicely. Have to take your time as with any project. My only complaint is with the 3/4 inch stock concern and the video could be better. I'd recommend this product. I purchased the system, read the instructions and had no difficulty with it operation whatsoever. I made two Boxes using all of the 4 patterns. Wish I could upload a photo. Thanks for the fast delivery at no cost. If you are using this system, any carbide steel is strong but can snap off very easy if banged against material. I have accidentally broken them myself banging against material. I have just finished cutting approx. 450 joints and breaking a bit due to hitting against the material. My Fault. One thing about the joints when putting them together is everything becomes square and solid providing all and i mean all wood must be cleaned out. Makes excellent joints and looks impressive. I have used 6 of the templates and they all look and work good. BEWARE this product is very limiting. You must use a minimum 3/4 inch stock for the front and back. The write-up is misleading. Only the sides of the box can be 1/4 - 3/4. So all four sides of the box will only be the same thickness if you are using 3/4 inch stock. I wanted to use it to build a humidor using 1/2 stock for all four sides and can't do it. Through dovetails can only be out 3/8 inch stock. I don't think that produces a strong box. I found this limiting and ultimately used my old dovetail jig. Because of the stock limitations I gave it 2 stars. On a positive note it is well built and the directions are exceptional. I am writing to you because I just bought your "Fast-Joint Precision Joinery System" I want you to know I am very happy with it. I spent a day reading the instruction manual and putting the assembly together. The instructions are very good, you have to follow every step, don't think you can skip over any of it!! You put it together one time and then you live with it forever! If there is any advice that I can give it is...when you are cutting "Take Your Time!" 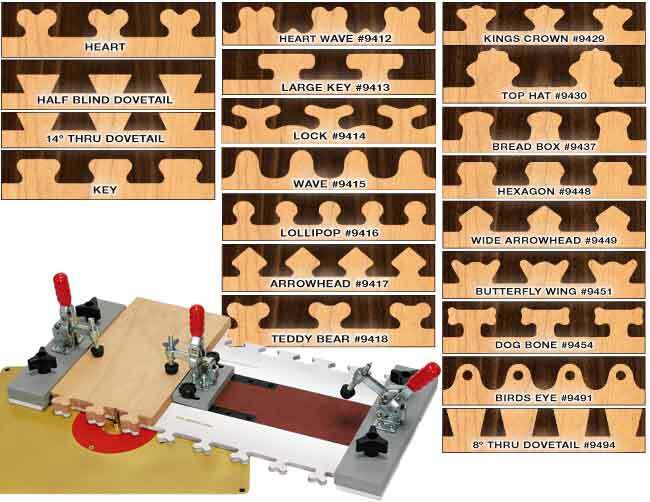 I am looking forward to making a lot of boxes! As far as rating this joinery system, I give it a full "FIVE STAR"
It's all I hoped it would be. Thank you for making this great tool! MLCS NOTE: This review was transcribed with permission from a letter we received via USPS Postal Mail. I Received this as a Christmas present. While going through the Assembly process (Step 4) alignment of the end pieces.I had one side square, and I was trying to slide in the MDF Sub-panel, this proved to be impossible. Checking the manual- states: if out of square will be tight. went through the square process 5 times with the same results. I Call MLCS. The woodworking Tech explained that some of the MDF Sub-panels were long. This piece is critical to align the two end pieces. They are going to send me out another MDF Sub-panel. I will update this review once I have received it. The reason for 3 stars (1)all the packaging was correct and in very good shape (2) customer support from MLCS was very responsive. A great product. I broke 3 bits when I first used them. I have found that the bits are defective. They are ground off center. I bought carbide bits from MLCS and have had no trouble since. I have made about 25 or 30 boxes. First practice project a flower box was snug, but went together well and I was pleased. Centering is important and test this with thin stock to see if the edges are equal around one of the shapes. A mistake that might be common: I used my own bit and I'd not realize the shaft had heated up the brass bushing so hot it melted the template. It also ruined the router plate insert by slightly deforming it. It took some time to figure out what went wrong. Moral of the story, I guess we have buy their bits! Otherwise, I'm determined to make this work. I've only used the heart template so far. The joints are just too tight to go together even though I've cleaned out the templates as instructed. It looks like the bit is not centered PRECISELY (I would have written PRECISELY in much larger font if I could). Very very close is NOT good enough. I am unable to adjust my router so I wound up making the final passes from different orientations to the bit and this seems to have worked. The joints went together but there are very tiny space - if you look closely at the joint. I cannot stress enough - the bit must be dead-on center for this system to work correctly. I have had this Fast Joint system for a few years now and just love it. Easy to use and produces some great results! I have used the Fast Joint System for several small projects, using the decorative temeplates. I am still trying to get it dialed in. My joints, in most cases seem to be to tight. What has been most troubling so far is that I have broken 3 of the 3/16" up-cut bits. In each instance I did not feel that I was forcing the bit or cutting too much stock. If anyone has any suggestions I would appreciate receiving them. I ordered and received it within 4 days. The set up was easy as was the instructions. I was impressed with the quality of the cuts the first time. I would high recommend to anyone. The setup was a long process. But I understand the need for assembly when it comes in a very small box. After completion of the setup and with sized and good wood the first cut was made and I completely destroyed a template somehow, the guide did not ride against the pattern and ate into the white pattern. I do not know if a person can purchase just one pattern? better yet one half of a pattern. I accept fault responsibility but still can not see how the guide faulted. The shipment arrived in short order and in great condition. The instructions and assembly were very easy to do, I being more of a woodturner, even found this to be easy. I did have to call and ask a few questions though. As with any new product there is a learning curve, as minor as this was. And with the help of Mike and Joe, (tech support), were very helpful. I even called and spoke to Mitch, by the way is very cordial and took the time to go into detail to help me out of a jam. With the great customer service, I am on the way to making some nice keepsake, jewelry boxes and humidors for some Christmas presents. The only template I have used at this point is the heart shaped, but look forward to using the others as well. More orders will follow to MLCS without hesitation. Thanks MLCS for a great "SYSTEM" that does what is advertised. I did not expect success with the first joint I made, but I did. A perfect joint. SAVE $40! 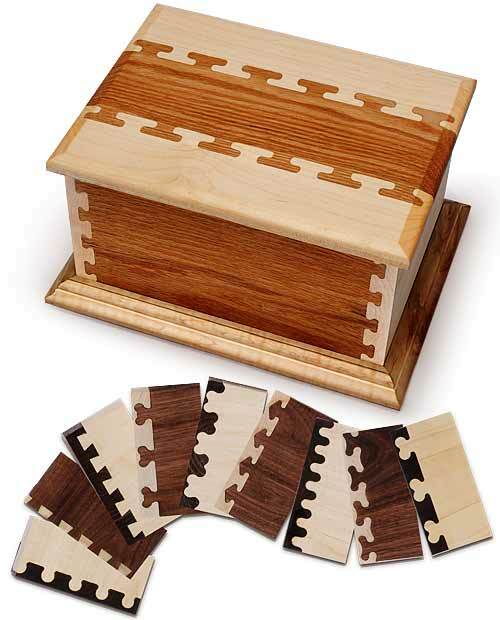 Includes the complete 4 Template Fast Joint System #9411, plus 7 additional 2 piece template sets (see below), for a total of 11 templates. List price $309.60. SAVE $40! Includes the 4 template Fast Joint System plus 7 additional templates. List $309.60. SAVE $99! Get every Fast Joint template! 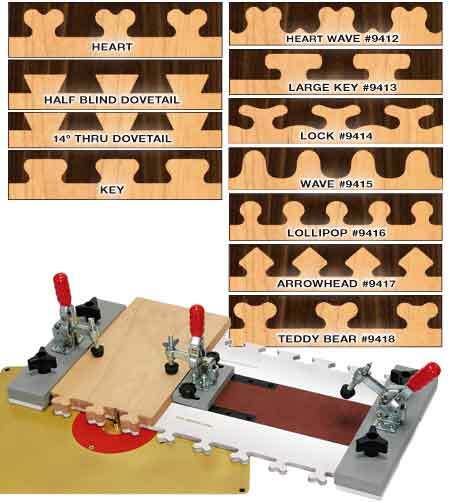 Includes the the 11 Template Fast Joint System #9422, plus 9 additional 2 piece* template sets listed below.